Hire the top 3% of freelance financial forecasting experts. Toptal is a marketplace for top financial forecasting experts, consultants, and specialists. 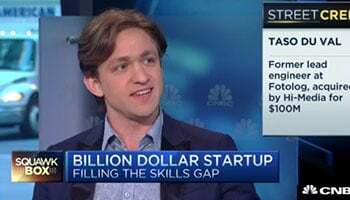 Top companies and start-ups hire financial forecasting freelancers from Toptal for their mission-critical projects. Financial forecasting experts provide the industry knowledge and deep analytical skills needed to forecast sales volume and supply chain metrics with confidence. This guide provides a breakdown of the key skills and attributes you'll want in a financial forecasting expert. To even begin understanding how market demand will affect the sale of your business’ goods and services is a daunting task. From seasonality to abrupt changes in demand levels, from strikes to macro events, a manager trying to anticipate future sales can quickly find their head spinning. On top of this, sales projections are an important factor when planning for cash flow management, inventory control, and the overall direction of your business. While forecasting can be a time- and labor-intensive process, a skilled financial forecasting expert can add tremendous value to your business by ensuring the forecast is as accurate as possible while taking the associated work off of your plate. Even in cases where forecasting is conducted in-house, it pays to have an unbiased third-party expert come in and spot-check key inputs and assumptions to make sure your projections account for the unexpected. Finding the right financial forecasting expert for your business comes with its own set of challenges. In this hiring guide, we will address how to identify the right candidate for the role and create the best environment for a successful engagement. Why Hire a Financial Forecasting Expert? Below are some of the most common reasons for retaining a financial forecasting expert alongside case studies to provide insight into how they can help your business plan for the future with confidence. While you may have the component parts needed to build a full sales forecast (e.g., an internal finance team, historical financial data, macroeconomic forecasts, and market research reports), it can be incredibly time- and resource-intensive to conduct a rigorous financial forecast, putting a strain on yourself and your company’s internal finance team. Furthermore, outsourcing provides a degree of impartiality in the analysis—a freelancer is incentivized only to do as good a job as possible, not to provide management with a rosy picture of future sales. Case study: The VP of Finance of Able Aeronautics, a company that designs, manufactures, and sells airplanes and satellites, needs an experienced financial forecaster to direct a team of junior financial analysts in building out a sales forecast. Prior to kicking off the engagement, what information does the forecasting expert need to ensure a successful engagement? What’s the context and objective of the forecast? What’s the relevance and availability of historical data? What’s the desirable degree of accuracy? What time period should the forecast cover? What time frame is available for conducting the analysis? What are the political/legal issues related to the forecast? Be aware of current laws or expected changes in laws that affect forecasts. What are the major revenues and expenditure categories, as seen by management? While the forecasting expert can (and will) answer many of these questions on their own over the course of their analysis, you want to start them off in as informed a position as possible. With these bases covered, they will begin to think about how business cycles, demographic trends, and anomalies in the existing financial data could affect their analysis before moving into the selection of the forecasting method. The forecast itself will involve a blend of qualitative and quantitative research skillfully woven together by the financial forecaster to arrive at the clearest projection possible. Both types of research vary considerably—different types of models within quantitative methods, and different scopes of sources within qualitative—and will depend on the specifics of the forecast in question. 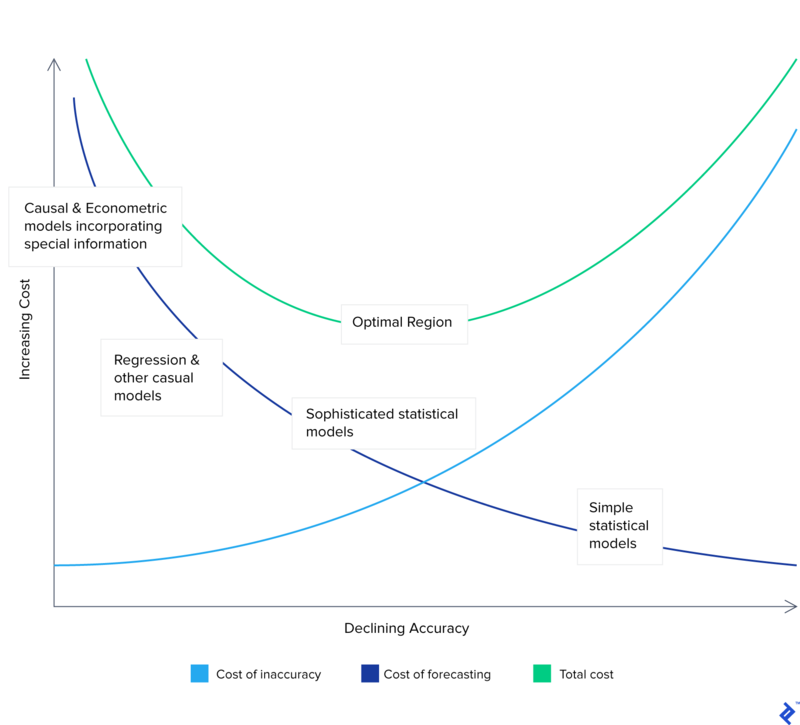 When forecasting, there’s a trade-off between the cost and accuracy of the forecast; an expert forecaster should take into account the context of the forecast prior to deciding on a methodology. For the inexperienced or in-house forecaster, it is all too easy to be overly optimistic when forecasting financials. It’s essential to hire a seasoned professional to make sure you can meet your financial obligations even when things don’t go as planned. Case Study: Bubbling Beverages, a consumer beverage company, just finished preparing their sales forecast for the year. After looking at the projected expenses, the CEO is worried that the projections are not grounded in reality and decides to hire an external consultant to sanity check their model. How would the financial forecaster challenge the assumptions driving the forecast? As an initial sanity check, the financial forecasting expert may begin with a top-down approach and look at gross margin, operating profit margin, and total headcount per client, comparing Bubbling Beverage’s ratios to the averages in the industry. Next, an unsparing financial forecaster should challenge all assumptions informing the forecast. For example, if the Bubbling Beverages CFO expected their soft drink division to grow 5% next year, yet it’s been in steady decline for a decade, new laws are going to tax soft drinks higher, and a survey the forecaster conducted shows that the company’s largest customers plan to spend 10% less on soft drinks next year, then this assumption should be called out. The expert forecaster should similarly challenge the assumptions for all major contributors to cost and revenue. While it’s tempting to put together an optimistic forecast where revenue goes up and to the right quarter after quarter, it’s essential to have a conservative forecast prepared to make sure you’ll be able to cover all of your obligations in the case where anything goes wrong. It’s also useful to think about an optimistic case, which will enable you to avoid sitting on a pile of cash in the case where everything does go perfectly as planned. Case Study: After the forecaster has pressure tested the model, the CFO of Bubbling Beverages extends the engagement with their financial forecasting expert to build out additional cases. How might the financial forecaster adjust the model assumptions in the base case to build a conservative and aggressive sales forecast? Financial forecasters often rely on historical data to map trends and determine how they will influence the business, making a solid grounding in financial modeling and statistical analysis a must for any financial forecaster. A truly skilled financial forecasting expert will have a big-picture mentality and connect the dots from the sales forecast to other areas of your business. For example, the accurate estimation of sales can offer insights towards cash movements, allowing you to plan for future shortfalls and, hopefully, windfalls. Additionally, a thorough sales forecast will accomodate assumptions such as changes in customer habits and macro increases or decreases in demand. In effect, this forecast will allow for efficient inventory planning, thus driving working capital efficiency higher. This could then spill over toward better planning of raw material inputs and labor hiring. In addition to their ability to think big, an expert financial forecaster must also be an excellent communicator. A core part of the forecaster’s job is the preparation and presentation of reports, charts, and tables that detail how market factors should inform marketing and production strategy decisions. They need to have the communication skills and forecasting expertise to highlight the information that should have the biggest impact on your decision-making while also managing to minimize the noise. What is the purpose of the forecast? How is it to be used? What are the relationships between the different parts of the company for which the forecast is being made? Is there a flowchart showing the relationship between distribution, sales, production, and any other relevant parts of the organization? What major initiatives does the company have planned that may influence the forecast? Are there any impending events on the horizon? New products, new competitive strategies, and impending regulation are some examples of things you may want to call out. To conduct a proper financial forecast, the expert will need access to historical sales data as well as access to salespeople and relevant executives. Board meeting minutes can be especially useful in helping inform your forecaster. You should provide the freelancer with access to these resources at the start of their engagement (send over the files, make the necessary introductions) so they can hit the ground running. If it isn’t provided at the start of the engagement, be sure to ask your financial forecasting expert for a roadmap that includes dates for key deliverables. This will help ensure that you and your freelancer are aligned on expectations and the engagement goes smoothly. Accurate financial forecasting will always run up against the uncertainty of the future. You may turn on the news tomorrow to find the markets in complete turmoil or to discover that Amazon has made a major acquisition in your industry. While there’s no amount of planning that can fully account for that type of event, a savvy manager knows that there is still plenty that rigorous forecasting does get right. The evaluation of a business’ current and future financial situation through forecasting is a necessary step for all managers.